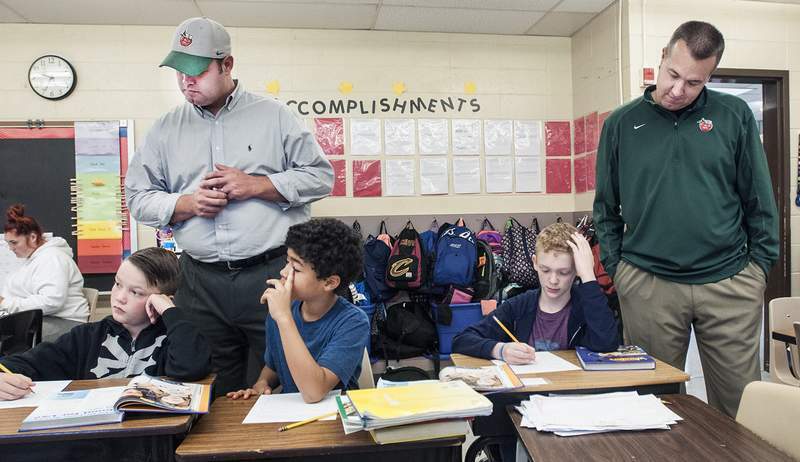 Photos by Cathie Rowand | The Journal Gazette TinCaps President Michael Nutter, right, principal of the day at Holland Elementary, and Principal John Ankenbruck observe Kapree Sisson’s fifth-grade class Thursday. Nutter gives a high-five to fourth-grader Winston Sellars while touring the school with Ankenbruck. The Civic Theatre's executive artistic director seemed willing for anything Thursday as he briefly experienced what leading South Wayne Elementary School is like. Monitor the cafeteria at lunchtime? Check. Read “Interrupting Chicken” to a second-grade classroom – and do voices for the characters? Check and check. 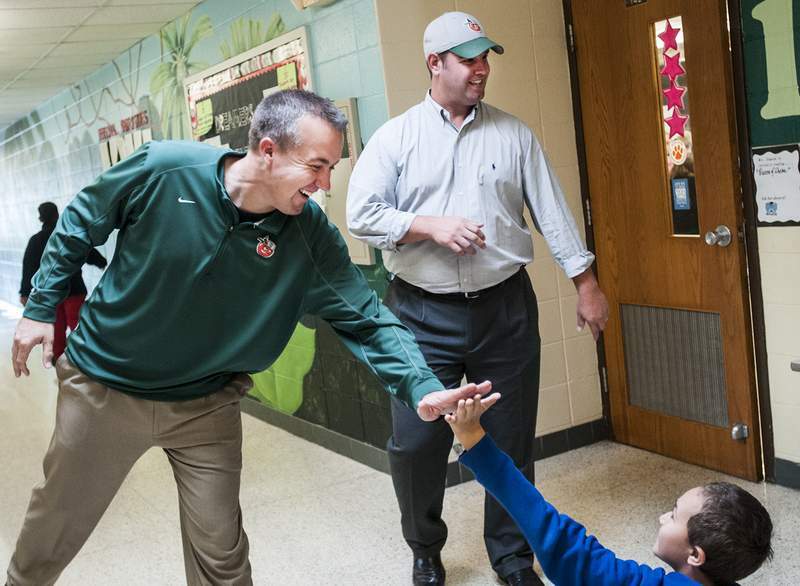 Phillip Colglazier was among about 50 community members – including media personalities, state legislators and the TinCaps' president – who participated in Fort Wayne Community Schools' annual Principal for a Day program. Superintendent Wendy Robinson said she enjoys showing guests what happens in the schools, and Principal for a Day takes it to the extreme. Brenda West, the South Wayne principal, remained at Colglazier's side as he toured the school. She gave him her hand-held radio, told him he was in charge and guided him through such duties as dismissing lunch tables. At her behest, he stood next to a trash can at the end of a table and held up two fingers, indicating to students that it was time to stand up. “OK, now three,” West instructed, later explaining that hand signal tells students they may walk toward the bin and dispose of their waste. The hallways were quiet as West showed Colglazier the school and explained items on the walls, including student work involving everyday application of multiplication. She likes Principal for a Day because it gives community members a better picture of what happens in the schools. Plus, she said, the guest principals expose students to jobs they might not know much about. The day, however, can lead to unintended, humorous consequences, she said: students mistakenly believing she has been replaced.